Making The Most of Free Software: Facebook Photo Editor! Did you know that when you're uploading photos to Facebook you can edit them? It took me *ages* to figure this out (mostly because I kept ignoring the fact it said "Edit Photo" and showed a little paintbrush when you hovered over the photo). when you hover the photo after uploading it. One day my curiosity got the best of me and I thought to myself I may as well give it a go - and plus, sometimes I can't be bothered to use my go to photo editing site: PicMonkey. I love PicMonkey, don't get me wrong, but sometimes it's nice to have an even quicker way to edit a photo. It's so simple and easy to use. You can zoom! You can crop! You can add text! 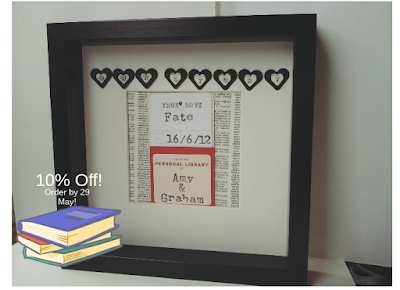 One feature I really like to use is adding text and stickers to the photo, especially if I am running something like an offer or a giveaway. It just adds a little pizazz to your photos that I think people like to see! 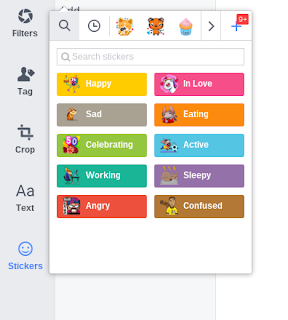 Click on the stickers smiley face, seen in blue below. It will bring up a drop down menu. I like to use the "search stickers" options and type in key words in the hopes that I'll find something useful. 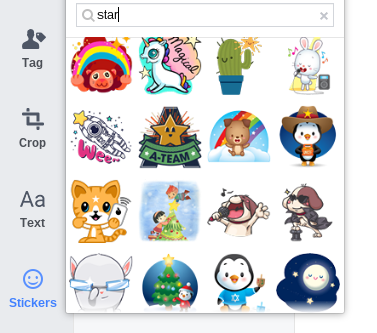 A lot of the options are just so cute, I typed in "star" to see what sort of things are on offer. As you can see, lots! In the end I opted for something that went with my library print card: a stack of books! I only wish there were more font options, maybe that's something Mr. Zuckerberg will think about adding in the future! The text option is very basic - you only have about 5 fonts to choose from and they're all quite boring! You can only use this feature when posting photos as your real self so no using it as your business page! It only works uploading photos to your wall or to a page wall that you are visiting as yourself. You cannot edit pictures you upload in comments. So far I have not found if Facebook saves these edits to your computer. Makes it a tad harder to then just upload the edited version of your photo that you've just made. You'd have to go through the process again OR you can save image yourself after it's uploaded. I have no idea if this feature is available using the mobile app! If this is all news to you - great! I hope it can help and gives you something new to try when you're networking and uploading photos. Cheers and happy bank holiday weekend! Making the Most of Networking: Scheduling! Below is a list of three major networking sites for those who run small crafty businesses. If you see any updates I should add or corrections, please let me know and I'll edit accordingly! Also have: #WowWednesdays, Early Bird and Night Owl daily, Show makes in different colours/price ranges that are then sometimes shared to the wall/placed into albums on the HTLMP page. This is *not* an exhaustive list by any means! But these are three groups that I am trying to focus on. There are a lot of networking groups out there - but some of the best advice I’ve seen from HTLMP is to not spread yourself too thin. You want to maybe pick 2 or 3 that you know you can devote your time to and be seen daily/frequently so people start to recognize and know you. You then become a person worth recommending to others when someone’s looking for something specific. You’ll also be able to keep up with engagement if you focus on a few sites rather than trying to post to 15. If you need help finding places to showcase your work and network: ask in groups you are already a part of, do a quick Google or Facebook search of something like “handmade gifts” and see what pops up, look for buy/sell groups in your area as most of them allow business posts. These are just a few ways to find new groups. I have found that my networking comes in waves - I’ll be really good and then all of a sudden I miss a few events, get flustered and stop for awhile feeling a bit defeated that I can’t keep up with it all. This of course means I lose my reach and being seen by the community who may be buying from me. So I created the above Network Schedule as a handy reference guide to look at throughout the week. Yes these events happen weekly at the same time and dates but it can be hard running a business, running a house, running after your kid(s) to remember them all! For me, if I can see it in list form it helps me tremendously and hopefully this can help you too! 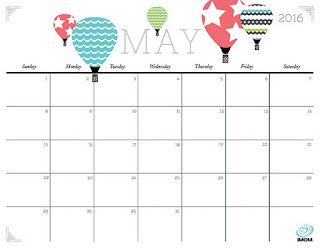 My next stop is printing off a calendar and scheduling in the events I want to take part in. My aim is to do this monthly: plan the whole month out so that it becomes part of the job of having a small business and treating it as such will hopefully help me keep my focus. If for some reason I miss an event, I’ll try to make up for it by participating in another. Do you have any networking tips we could benefit from? Leave them in the comments! Here’s to networking and being seen! This week on meet the makers we meet Jenny, the creator and designer behind one of the coolest concepts out there: mystery craft boxes! 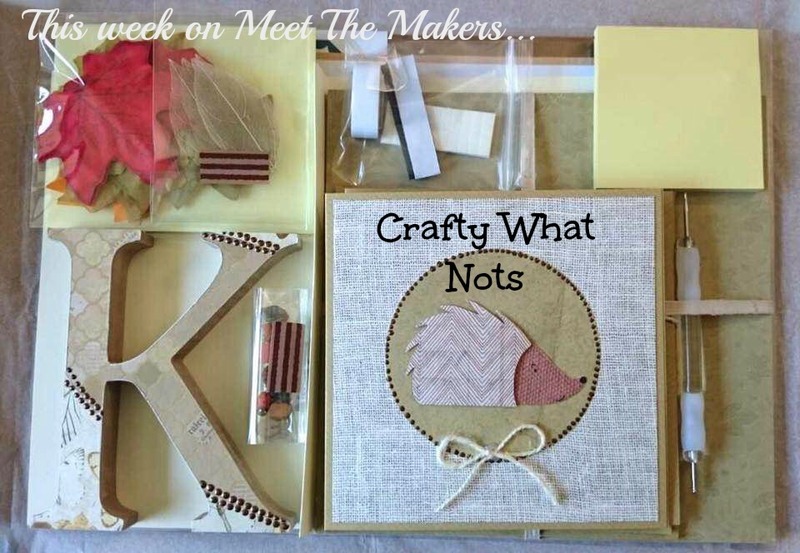 There's nothing better than getting a bit of post but how great is it that you can sign up and know each month you'll receive a box filled with fabulous crafting items and tutorials?! Read on to find out more about Jenny! Hi, my name is Jenny, I'm 39 and I live in beautiful Dorset with my partner and our three wonderful daughters. I am also a total craftaholic! I caught the crafting bug at a very young age and tried so many different crafts and strangely enough, in varying forms, I still do many of them! I am the designer behind Crafty What Nots, the monthly mystery postal box. I also run Jennysis where I do portraits and sell a variety of other crafty items. This week on Meet The Makers we meet Louise, a paper cutting artist extraordinaire! 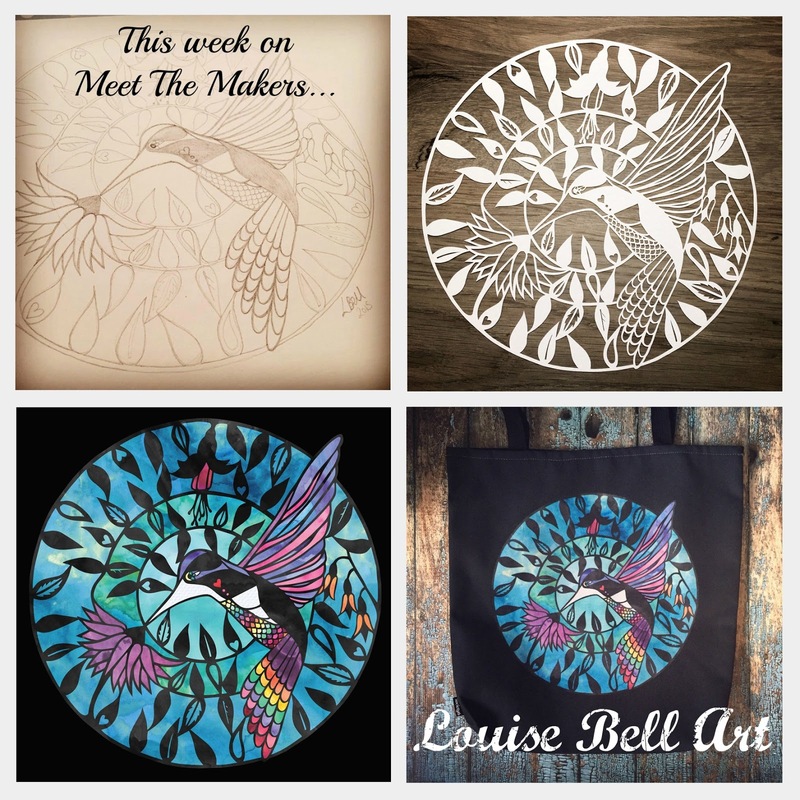 Louise's skill with paper is truly amazing and her designs look fabulous on just about anything (look at that gorgeous bag!) - they'd make a great colouring book! Happy Reading! Go on - introduce yourself! I'm Louise a paper cutting artist and graphic designer from Kent, England. I'm married with two children and a cat called Daisy. I actually have two businesses: Magentasquare, a graphic design agency working mostly in the events industry and Louise Bell Art where I create unique handmade pieces of art, cut out of a single sheet of paper using my hands and a scalpel. When did your business launch? What was the spark that led you to starting it? I started Louise Bell Art in August 2014 when I first had the confidence to start up a Facebook page and to start selling my work. 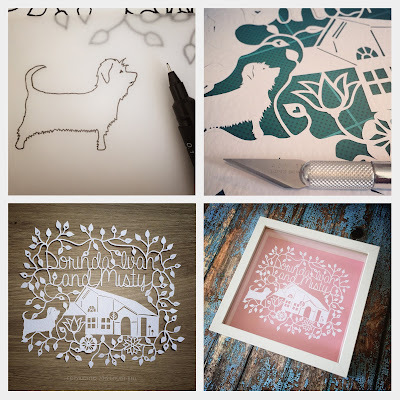 Before that, I had been paper cutting since 2012 as a hobby making pieces for family and friends. As more people saw my work I started getting asked if I took on commissions, so I decided to take the plunge. Everything else slowly came as a natural progression, Website, Etsy, Instagram, twitter etc. In 2011, we moved house and also found out we were expecting baby no 2. 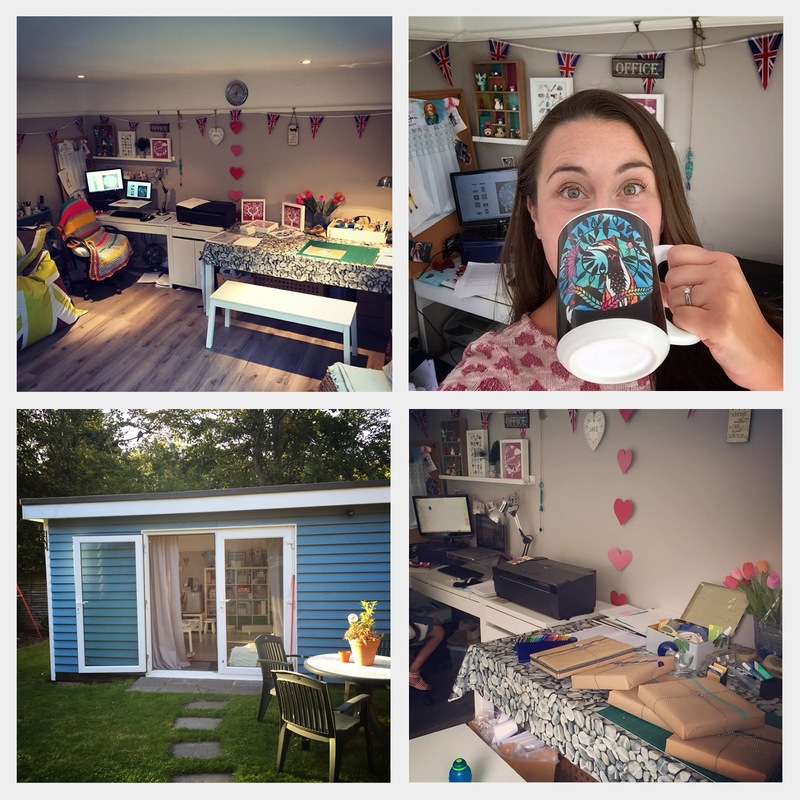 As we now needed my office space as a bedroom for the new addition, my husband built me my own space at the bottom of the garden. It was this space that gave me the room to do more arts and crafts. Especially once my son came alone, I could leave it all out and just shut the door behind me. Show us your work space! Do you have a shop? Strictly from home? Tell us about it! I mainly work from home these days because I try and fit life around my children, although every so often I work on big corporate events as graphics crew. One of my favourite places to work is the BT Tower. If I'm lucky I'll get to have lunch with the delegates on the 34th Floor. Look at that amazing summer house shed! 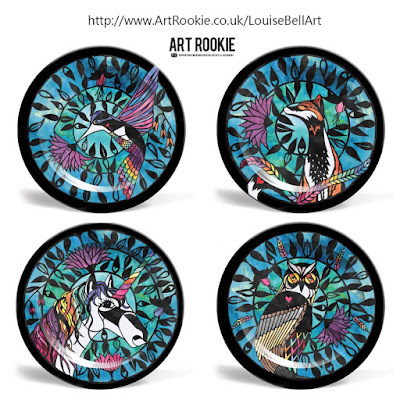 Image provided by Louise Bell Art. What has been your favourite make so far? What’s been your most popular? My favorite makes so far would have to be something from my 'Leafy Collection'. Maybe Mr Fox or the hummingbird. They have been a labour of love. Every part of the process has brought me joy. 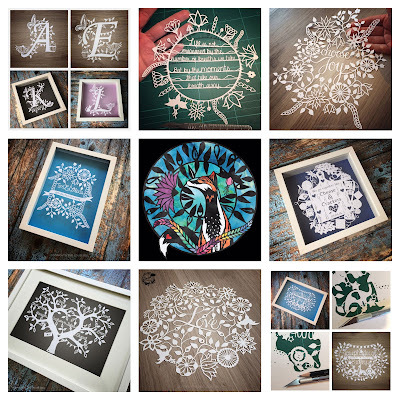 From the initial pencil sketches, paper cutting, creating the digitally coloured designs, to the merchandise I now sell on ArtRookie and Society6. My most popular make would have to be my family trees. I've sold many through my Facebook page and Etsy. I love getting to know my customers when making them and knowing that I get the opportunity to create something special that's going to be cherished for a lifetime. How do you generate new ideas for items? New ideas come from everywhere. I'm always drawing. I feel restless if I don't have a project on the go. We try to go out exploring as a family as often as possible, even a day on the beach will get me drawing fish or mermaids in the evening or a trip to the park will inspire some papercut flowers. Last year my daughter turned the right age to appreciate a trip to an art gallery and an afternoon tea! So we had a few days out to London to visit a few of the big galleries. My all time favourite artists are Frida Kahlo, Georgia O'Keefe, Lucian Fraud and Rob Ryan, of course. I'm a Mummy first so between 6am and till the children go to school / play school it's hectic. I'm crazy running around like a mad woman, sorting breakfast, clothes, washing on, tidy the house, quick check of Social Media so when I get back at 9am ish it's calm and I can get started with work straight away, well after I've made myself a coffee. Everyday is completely different in my world but a typical day. I'll have a few hours of presentation graphics to design and then I'll email the designs off to my client. While I'm waiting for client amendments I'll slide my chair over to the huge table I use for papercutting and I'll either be drawing out a new design or carrying on with a customers piece. My email will ping and I'll slide myself back for more presentation graphics. If I'm working all day my parents pick up the children for me or I'll have the school run about 3pm. If the children are at home with me I'll do a mixture of family stuff and dinner while updating a few social media posts. After the kids are in bed and if I've worked all day your probably find me on the sofa watching TV with the husband, if the program doesn't keep my attention I'll possibly end up drawing or perusing Social Media. What are your favourite social media platforms to use for promoting your business? Facebook, Instagram, Pinterest and Twitter. What are your hobbies - other than crafting of course! What three pieces of advice do you have for someone wanting to start their own small business (and maybe advice you wish you’d had before starting)? There is no perfect time to start you need to make the brave leap. and a big one I have to still remind myself about - Your are not for everyone, so try not to worry or waste valuable time trying to please these people. Keep being your authentic self. What are you dreams/goals/aspirations for your business? I do have a few huge dreams I'd love to create a colouring book, make more paper cutting templates so others can have a go at cutting my designs and a really big one, for my papercutting work to be featured in an art exhibition. But mostly loads of the same, I'm very proud at what I've accomplished so far. 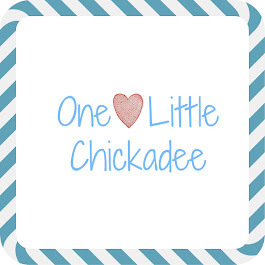 My youngest will be at school full time in September so I'll have even more time to create for my customers and myself. This week on Meet The Makers we meet the amazing Heidi of Handmade by H. Her work is truly gorgeous - the patience and steady hand it takes to create these lovely papercuts is amazing! Happy reading! Hello! I'm Heidi, I'm 32 and I'm addicted to to paper! He he :) I have 3 children who are 3,6 and 9 and are my biggest critics. I've been married to Andy for 10 years, he is also known as Mr HBH the frame cleaner. We have a cat called Pippy-Lou who is probably the grumpiest cat in the world, she does love to help me though especially when I have the ribbon out! We live in beautiful North Wales not far from Llandudno. 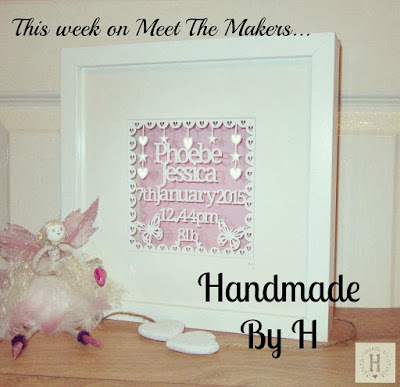 I'm really excited about this week's instalment of Meet The Makers - so much bling and sparkle! 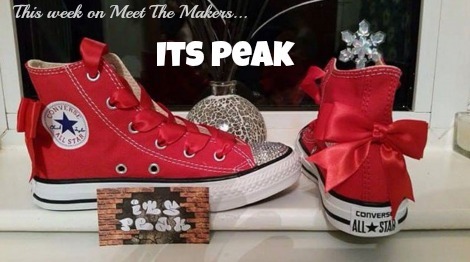 We meet Anthony and Sasha, a delightful duo who work together to bring you fabulous and flashy designs in their customized footwear and clothes. 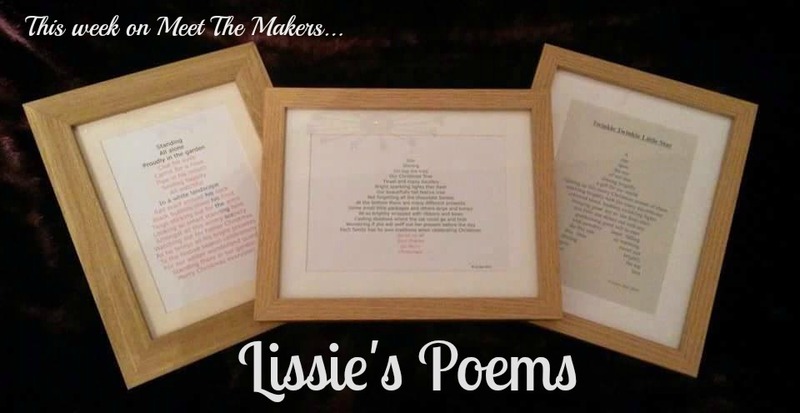 This week on Meet The Makers we introduce you to Lissie's Poems! Lissie writes beautiful poetry that make wonderful and extremely thoughtful gifts. If you're looking for a truly personal gift for a friend or loved one, look no further.